Today’s mail brings news of a relic from the American Revolution involving Dr. Amos Mead. He is interred in the New Burial Grounds Association Cemetery next to the Second Congregational Church off East Putnam Avenue in Greenwich, Connecticut. 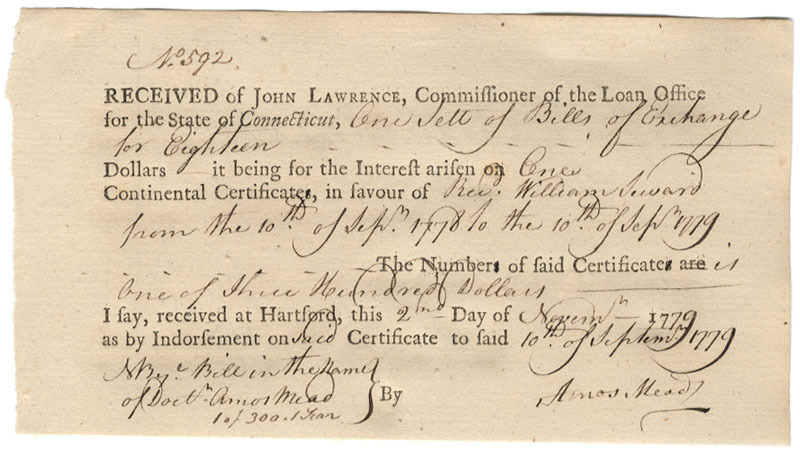 Scott Winslow, a dealer in historical documents in New Hampshire writes, “I am a dealer in historical documents from New Hampshire. I'm forwarding a scan of a document signed by Dr. Amos Mead during the American Revolution which I thought you might have an interest in. 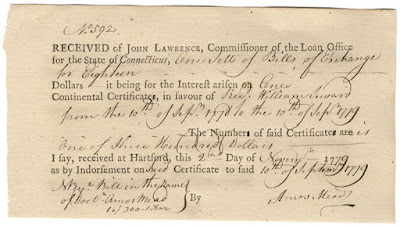 I recently sold an early Connecticut pay order issued to (not signed by) Dr. Amos Mead but frankly, can't remember who I sold it to and thought it might be someone in your family.” The document image is provided here. This text is also found on page 145 of Ye Historie of Ye Town of Greenwich, also authored by Spencer P. Mead, published in 1911. Both the town history and Mead family genealogy book feature more interesting background on Dr. Mead. If you are interested in acquiring this wonderful piece of family history please contact Mr. Winslow at 800-225-6233, or e-mail him at Scott@scottwinslow.com.